Here's a healthy salad that even young children can make. 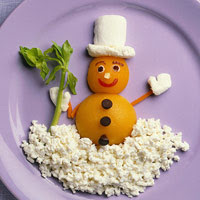 Use peach and apricot halves for the snowman, celery for the broom and cottage cheese for the snow. To make snowman, use peach half for body and apricot half for head. Using cream cheese, cheese spread, or peanut butter as "glue," create a face with raisins or currants, cherry, and almond. Use chocolate pieces for buttons and carrot or zucchini sticks for arms. For the hat, cut 1 marshmallow in half. Flatten 1 of the halves. Attach to second marshmallow for hat brim. Use the remaining marshmallow half for mittens. Use a celery stalk for a broom. Place drained cottage cheese around the base of the snowman. Makes 1 salad. Calories 234, Total Fat 4 g, Saturated Fat 2 g, Cholesterol 12 mg, Sodium 521 mg, Carbohydrate 32 g, Fiber 2 g, Protein 17 g. Daily Values: Vitamin A 28%, Vitamin C 9%, Calcium 10%, Iron 4%. This entry was posted on 2:48 AM and is filed under Salad . You can follow any responses to this entry through the RSS 2.0 feed. You can leave a response, or trackback from your own site.